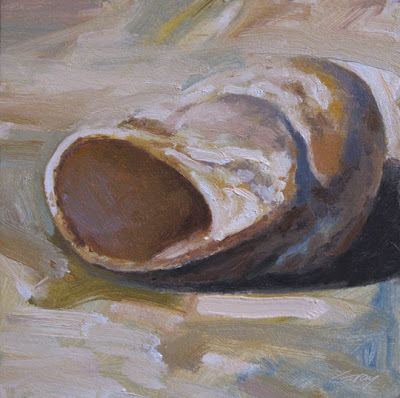 This was fun--a more painterly take on a shell. this new series seems to be evolving: i can smell the sea and taste the salt with this one. beautiful! Thanks a lot, Rahina. I've started playing with more abstracted versions of the shells--somewhat like my stone series...will post more. I enjoy seeing your new work. These little shell paintings resonate in a very deep place. Perhaps as we are all feeling the loss in the Gulf, I've wondered if it is deep in our DNA, to the time we crawled from the salty water to walk on land? Thank you for this work, it's beauty and it's universal quality. Brilliant idea to have a shell series - especially delivered in a fresh style like this. I always enjoy a visit to your view of the world and its denizens. Each of your works shows great craftsmanship, a knowing eye, and rendered in a rich brush stroke environment leaving no doubt that these are real paintings. Annell, your comments are so kind and much appreciated. Yes, turning to these shells right now certainly must be related to my thoughts of the Gulf disaster...it is so heartbreaking. Bill, it is nice to hear from you. Thanks for your thoughtful comments--they always mean a great deal. You continue to astonish with each new piece.